A racquet's power potential is determined in the lab by measuring ball velocities and calculating the ratio of the ball's outgoing bounce speed to its impact speed. 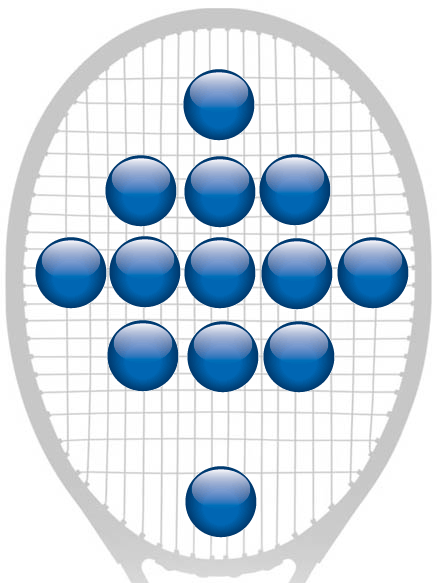 The impact speed is defined as the combined speed of the racquet and ball just prior to collision. For a given hitting location the power potential is always a fixed percentage of the impact speed, is a different percentage for each location, and generally varies from racquet to racquet. For example, if the power potential is 40% in the center of the racquet, then the ball will bounce from the racquet at 40% of the impact speed. The speed of this bounce is determined by the "local" weight, frame stiffness, and stringbed stiffness at the impact location.